A Game Plan for Life - Doug Grad Literary Agency, Inc. He was known simply as “Coach,” as he was voted the greatest coach of the 20th Century by the Basketball Hall of Fame. 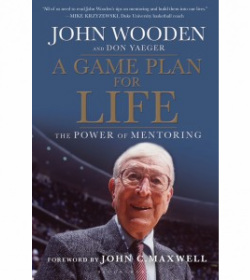 John Wooden—who reigned supreme at UCLA from 1949-1975, was 99 years young, still active, and still beloved as not just a great coach, but a great teacher at the time of this book's writing. In A Game Plan for Life, Coach Wooden talked about mentors and mentoring—and he had nearly a century of experience to mine. Think Harvey Penick’s Little Red Book but written by a basketball teacher, not a golf teacher. Think Tuesdays With Morrie meets Pay It Forward. It’s all about applying the lessons you learn from others on the court, in life, and in turn passing those messages along. Wooden had some surprising mentors—his wife Nellie, Abraham Lincoln and Mother Teresa among them. And the beneficiaries of his mentoring weren’t confined to the likes of Bill Walton and Kareem Abdul Jabbar, but number his oldest great granddaughter among them! Small in trim size, easy to read, A Game Plan for Life is as much Chicken Soup for the Basketball Soul as anything—a quick primer on how we can all get more out of life by learning from those around us, and teaching those lessons to others. Coach Wooden was a national treasure, and his previous books continue be among the bestselling sports titles on Amazon.com, year-in and year-out. John Wooden was the head coach of the UCLA basketball team from 1948-1975, winning ten NCAA titles as a coach, in addition to one as a player with Purdue. He was the NCAA coach of the year six times. Wooden is a member of the National Basketball Hall of Fame as a player and a coach, and the College Basketball Hall of Fame. As a player, Wooden was a three-time All-American. Don Yaeger is a four-time New York Times bestselling author, former Sports Illustrated Associate Editor and award-winning motivational speaker. He lives in Tallahassee, Florida with his wife and son.